Deposit account of 25% of the total amount of your stay and 10 € for Administration costs when you send your contract of reservation.. The balance of your stay has to be paid the day of your arrival. Deposit account of 25% of the total amount of your stay and 10 € for Administration costs when you send your contract of reservation. The balance of your stay must to be paid one month before your arrival. You will receive a confirmation letter who is valid your contract. At you arrival a 250 € (180 € for the rent and 70 € for the cleaning) guarantee must be deposit at the camping office, it will be refunded if no damage has been done. If the place is in dirty condition the guarantee of 70 € is kept by the office for cleaning the lodging. Credit card, international money order or transfer from bank to bank to the order of "SAS RIGO - The Banks of the Aygues - 26790 Tulette" (all costs borne by the issuer) Bank: Crédit Agricole Sur Rhône Alpes - Domiciliation : Tulette (00147) IBAN: FR76 1390 6001 4785 0414 8124 856 BIC: AGRIFRPP839 Attach proof of transfer from your bank with your full name. The transfer must be made in the same name as the booking contract. 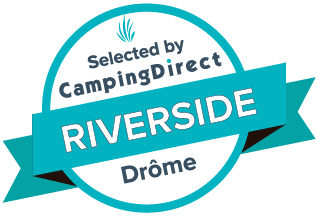 Our charming campsite in Drôme Provençale offers a choice of 91 locations, all different, divided into three categories: Pecioun, Mezzo, and Grande. Large sites have the distinction of being located at the edge of the river. Hurry up to book! Our packages include the stay of two people, with a vehicle, a tent or a caravan. Connection to the mains is extra. Ask the rate for any additional person! The Rives de l'Aygues, 3 star campsite with swimming pool in Drôme Provençale, offers for rent nine comfortable accommodations, ideal for a relaxing family holiday, with the charm of camping. You have the choice between mobile home of two or three rooms, new or old chalet, but also the hut lodge, charming wooden accommodation on stilts with terrace. Do not hesitate to ask ! To benefit from cancellation insurance, you will find more information on the page of our partner Axelliance.